For this edition of the Alan Aylesworth Macnaughton Lecture Series, the Rt. Hon. Richard Wagner, P.C., Chief Justice of Canada, will be interviewed in a public “fireside chat” led by McGill Law students. The diverse perspectives of younger jurists on law and justice can lead the Supreme Court to pose new questions, frame new institutional issues and identify new challenges that it will face over the next decades. Accordingly, the format of this year’s Macnaughton Lecture is meant to engage the direct and indirect participation of McGill Law students. This event is organized by Professor Daniel Jutras, holder of the Wainwright Chair in Civil Law. Please join us for a fascinating conversation! 2019 Wainwright Conference - L’avocat à la barre de l’action collective: une chasse-galerie? Professor Daniel Jutras, holder of the Wainwright Chair in Civil Law, gave his Wainwright conference in February. In his talk, he examined class action suits and the ethical aspects of taking public debates to the courts. The Wainwright Fund was established under the terms of the will of the late Arnold Wainwright, Q.C., who bequeathed a generous sum to promote the research and advancement of civil law at McGill University. Me. Wainwright taught civil law at the Faculty of Law of McGill from 1909 until 1934, after which he was named professor emeritus. In 1963, the University presented him with a doctorate of civil law honoris causa in recognition of his invaluable contributions to the legal profession and to scholarship in civil law. The Faculty of Law of McGill University established the Wainwright Fund, whose capital is guaranteed against inflation. The wide mandate of the Fund allows the Faculty to perpetuate, year after year, the remarkable contributions of this eminent Quebec jurist. Mtre Daniel Boyer, Ad. 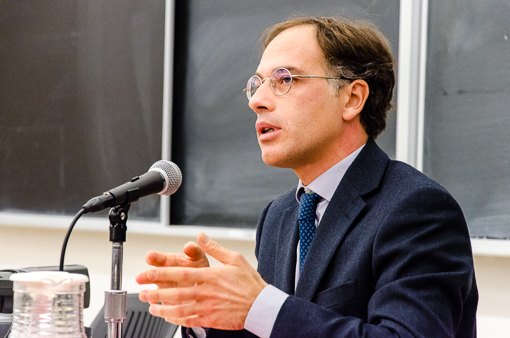 E.
On February 19, 2015, Wainwright Senior Fellow Giorgio Resta, Professor of Law at the University of Bari in Italy, gave the 2015 Wainwright Lecture. His presentation was titled "Les luttes de clocher en droit comparé."